CB550 Brakes: Dual discs or Not? Topic: CB550 Brakes: Dual discs or Not? So, I'm considering a dual disc conversion on my '78 550K because, well, it's fairly simple, the parts are relatively inexpensive and I think it looks cool. However, I know it adds unsprung weight. I've read that some people have difficulty getting the tire on and off with dual discs (but, really, how often do you need to do that?). And, truth be told, I'll rarely ever ride it hard enough to overcome the stock brakes. Still, I kinda want to do it. I've read FunJimmy's build and see he went with an upgraded single disc, but at a cost that's a fair bit higher than dual discs using stock components. * I've read about stainless steel and phenolic pistons. Why? If my stock stuff is OK, is it necesary to change them? * Dual/double banjo bolt. Am I correct in thinking that two stock lower lines are used with a long, dual banjo bolt and the stock splitter? Is that all it takes? What about using a GL1000 junction/splitter? * Master cylinder. There are multiple threads with multiple opinions. Much of it pertains to feel rather than actual proper performance. I'd still like to get some more thoughts and opinions on the best/proper master cylinder. * Weight. Is the performance upgrade worth the extra weight? * Cost. Can anyone make an argument for a good single disc upgrade vs. the cost of anther caliper/holder/rotor, proper m/c (if I can't use stock) and the speedo drive? Re: CB550 Brakes: Dual discs or Not? You have some good questions, I'm not an expert but I did do the dual disc conversion on my 77 CB 550. I used stainless brake lines, a gold wing master cyl, the stock splitter with a dual banjo bolt with new crush washers, lower brake lines are braided and I rebuilt both calipers with new seals and stainless pistons. The caliper arm, caliper, disc were sourced from fee-bay, and I drilled the rotors myself and then broke the glaze with a 220 mould makers stone (just a quick stoning). I did a shake down run on the bike after and was impressed, the brakes did feel better, I think it helped balance under hard braking (seemed the bike did not want to pull as much to the left, which it did before) also looks kinda cool tool. I'm sure how much it cost for everything, (would have to add it up) wasn't too terrible and I did buy the speedo drive from rangelov as well. Longer bolts were bought local. Mind you the picture I posted is just the test set up, I have since taken the bike apart and am waiting to take things to the powder coater and do some more polishing as well. I should note I never tested in the rain yet which I would like to do sometime. I did the dual disk conversion on my CB500. I bought the brake parts and rotor along with the front forks from a '75 CB550. I bought the speedometer drive from ranglov and the stainless braided brake lines from pampadori. I went with a double banjo bolt and two lower lines plus the one upper line, always get new crush washers. I bagged a '77 GL1000 master cylinder off eBay, at least I think it was from a '77, its the round one with a plastic reservoir to maintain the round style of the original master. It's a fantastic upgrade. The stopping power is much better. I did not get my rotors cross drilled yet. And yes I ride in all kinds of weather. The stopping power is not as good wet as it is dry, this is to be expected. Drilled rotors should help with this. I really didn't need to get both 550 forks as I only needed the right fork lower to do the conversion, the 500 lower right doesn't have all the mounting bosses for the caliper arm and adjuster. I figured that with the whole set of 550 forks I could upgrade the forks with the Racetech cartridge emulators when I could afford it, the 500 forks cannot be upgraded with these emulators. I didn't need to replace my caliper pistons, so I can't tell you which way to go there. I think maybe I would try the phenolic ones, but haven't decided yet. I'll get the rotors drilled first. What about those dual piston calipers from the CB650? Possible to make those work on a CB550? I sourced a second 550 disc off CL along with the mount and caliper. The conversion is pretty easy and the only issue I encountered is the speedo drive...plan on using a digital tach/speedo anyway so no big deal. All in all can be completed for around 150 if you watch feebay and CL closely. Drilling the discs can add up, but a cheap drill press can be had from harbor freight for 30-50 with a coupon. If you drill yourself, use the lowest speed and use plenty of oil. Have a few spare bits on hand too. I went through about 6 between the 50 holes. I didn't consider the cost of the drill press as part, because it is a tool and I have already used it for so many other things around the house. i did it -- spent too much money on it but am very happy with how the brakes work now as opposed to single undrilled disc. check my previous posts and you may find some of your other questions answered. 1976 CB550K: stock airbox, cb650 cam swap, 4x2 exhaust, dual disc brake conversion. 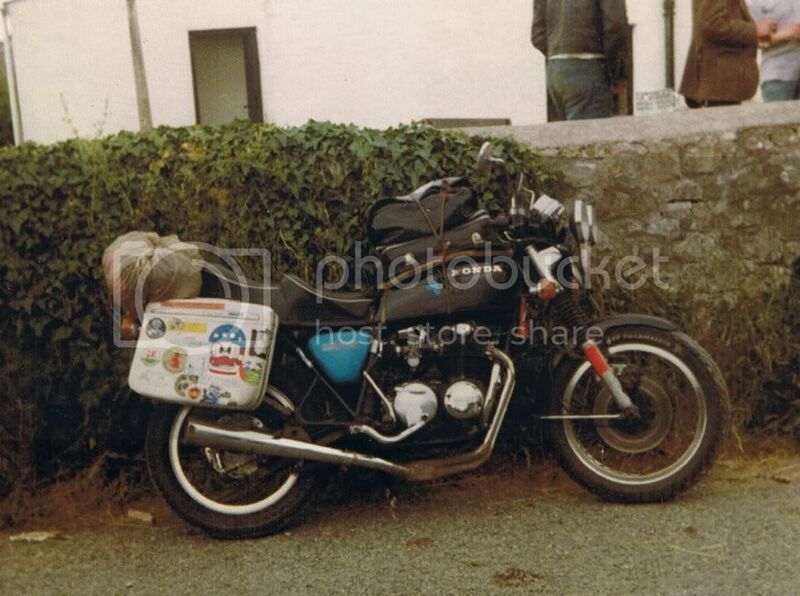 Not the best pic in the world, from around 1979~80? ? The phenolic piston does not does not develop rust pits like the factory chromed piston does that can lead to seeping brake fluid past the seal. It should last longer than the rest of the bike. I haven't used stainless but there is no need to spend the money they want for them. Plus stainless would be much heaver than the phenolic part. 75 CB550K1 - One owner, me. Close to being back on the road. VTX1800C for two up cruisin. Several others have come and gone but whose keeping track. "The best safety feature of any motorcycle is the one God put between your ears. It's also the least utilized"
Totally off topic.....BEST AVATAR EVER!!!!!!!!!LMAO!!!!!!!!! !